Fine needle aspiration cytology (FNA C) was performed in 108 cases with thyroid lesions and the results were correlated with histopathology. The overall diagnostic accuracy of FNAC was 96.7% with a sensitivity of 75% and specificity 100%. There were no false positives but the false negative rate was 3.6%. Although some limitations were observed in the diagnosis of follicular neoplasms, FNAC has been found to be a simple rapid, economical and fairly accurate diagnostic modality, and is valuable in surgical selection in majority of the patients with thyroid lesions. Cytological grading of FNAC smears of breast carcinoma allows assessment of biological aggressiveness of tumour in situ, assisting in preoperative planning of treatment regime including the use of neoadjuvant chemotherapy. Nuclear grading was effected in accordance with Fisher's modification of Black's grading scheme. Using similar criteria forgrading cytologic smears and tissue specimens, independent blind grading of the two, revealed concurrence of nuclear grade assignment in 96% of the cases. Aspiration smear pattern and nuclear grade were found to be associated. There was maximum prevalence of typical pattern (sheets and clusters) in grade I cases, while of cluster predominance in grade II and III cases. Only grade III cases had individual cell pattern. There was a strong correlation between nuclear diameter and nuclear grade in cytologic smears. All cases of nuclear grade I were of small nuclear type, while 75% of grade II and all of grade III cases were of large nuclear type. Since nuclear grade provides important prognostic information, is simple to perform and correlates with tissue nuclear grade, it should appear in FNAC reports on ductal breast carcinomas. Cytomorphological findings in six cases of Nephrobiastoma are described. All the three elements-blastemal, epithelial and stromal-described on histopathology were encountered in varying proportions depending upon differentiation. Blastemal component was seen as small round to oval cells with scanty cytoplasm and fine nuclear chromatin. Epithelial component was identified as rossette-like arrangement of blastemal cells and the presence of glomeruloid bodies. Stromal component was seen as spindle shaped cells with smooth muscle and skeletal muscle differentiation in one case each. These findings correlated well with the findings on histopathology as well as with immunohistochemistry. FNA is advocated as a safe and accurate procedure for the pre-operative diagnosis for chemotherapeutic protocols in Nephroblastoma. 132 patients of clinically significant lymphadenopathy were subjected to fine needle aspiration cytology (FNAC). Maximum patients were from the pediatric age group (39%). Lymphnodes of the left side were involved in 54 cases (40%) followed by right side in 30 cases (22%). Tuberculosis was diagnosed in 54 cases (40%) followed by nonspecific reactive lymphadenitis which was diagnosed in 50 cases (37.8%). The acid fast bacilli (AFB) postivity in tubercular lymphadenitis was 33.33%. There was one false negative in this study. The overall accuracy of the procedure was 91.5%. FNAC is a safe, quick, reliable procedure with high diagnostic accuracy. From January 1984 till June 1999 computerized tomography guided needle aspiration cytology (CT-guided NAC) was utilised to diagnose 989 osteolytic lesions of vertebrae of which 28 cases were categorised as giant cell tumours (GCT). Part of the aspirated material was subjected to cell block study in 23 cases. Open surgical biopsy with histology proved to be giant cell tumour in 26 cases and aneurysmal bone cyst in 2 cases. The diagnostic accuracy of exact typing of giant cell lesion byNAC was 92.8%. As it is difficult radiologically to distinguish tuberculosis, metastatic deposit and other primary vertebral tumours producing osteolytic changes, CT-guided NAC is extremely beneficial for the orthopaedic and neurosurgeons to arrive at a quick and correct diagnosis so that planning of treatment can be started early before compression of spinal cord. No complication was encountered in the present study. Extreme paucity of literature on CT-guided NAC of GCT of vertebrae prompted the authors to publish the article. 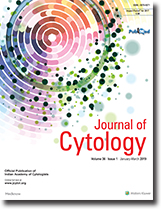 This is a retrospective study of fine needle aspiration (FNA) cytological features in four histopathologically verified cases. The cytological features of gastrointestinal carcinoids is characterised predominantly by clusters and few discrete round to oval cells. They have fine nuclear chromatin with inconspicuous nucleoli and scanty to moderate grey blue cytoplasm with occasional pink granules. Carcinoid tumors of gastrointestinal tract can be distinguished from adenocarcinomas using these cytological criteria on aspirated material. Anthrax is primarily a zoonotic disease. Human anthrax is fairly rare and occurs as sporadic cases or epidemic outbreaks. Clinical forms include cutaneous, pulmonary, intestinal and rarely meningeal types. Epidemics consist of a mixture of all the clinical forms and are usually associated with high fatality rates. Early diagnosis and prompt institution of antibiotic therapy and disease control measures are imperative for reducing the mortality. While isolation in culture media or serological methods are the standard modes of diagnosis, cytology is not a known method of diagnosis. Four cases of cutaneous and intestinal anthrax, which were part of an epidemic outbreak in Karnataka state, India, initially diagnosed on cytology and later confirmed by microbiological techniques are described here. Cytology of effusion fluids and FNA of lymphnodes offer a reliable and rapid method of preliminary diagnosis of human anthrax. A case of solid and papillary epithelial neoplasm of the pancreas in a 52 years old female diagnosed on FNAC and later confirmed on histopathology is being reported. The cytological features and the differential diagnosis in this age group are being discussed. Multiple cutaneous metastases of thyroid carcinoma are extremely rare. Most patients have an enlarged thyroid gland and blood borne internal metastasis mainly in the bone, lung, liver, breast and kidney. We present here a case of 50 year old male having multiple cutaneous swellings over forehead, nape of the neck, lateral neck, left shoulder and infrascapular region. FNAC was done from different swelling sites and multiple smears were prepared. These smears showed hypercellularity with follicular cells arranged in a microfollicular pattern, showing moderate anisonucleosis; mild features typical of a well differentiated follicular carcinoma of thyroid. A detailed clinical history revealed surgery for carcinoma thyroid 4 years back, diagnosed as follicular carcinoma thyroid (moderately differentiated). Fine needle aspiration cytology alone was found to be sufficient for the diagnosis of cutaneous metastasis of thyroid carcinoma eliminating the need for confirmatory surgical biopsy and immunocytochemistry.